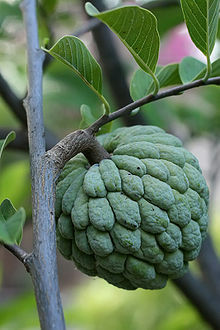 Guanabanus squamosus (L.)M.Gómez Xylopia glabra L.
Ang atis (Ingles: custard apple, atimoya, sweetsop, o sugar apple) ay isang uri ng puno at matamis na lunting prutas nito. Annona squamosa ang pangalang pang-agham nito. ↑ Natural Resources Conservation Service (NRCS). "PLANTS Profile, Annona squamosa L.". The PLANTS Database. United States Department of Agriculture,. http://plants.usda.gov/java/profile?symbol=ANSQ. Hinango noong 2008-04-17. ↑ Germplasm Resources Information Network (GRIN) (1997-07-11). "Taxon: Annona squamosa L.". Taxonomy for Plants. USDA, ARS, National Genetic Resources Program, National Germplasm Resources Laboratory, Beltsville, Maryland. http://www.ars-grin.gov/cgi-bin/npgs/html/taxon.pl?3503. Hinango noong 2008-04-17. ↑ Dr. Richard Wunderlin, Dr. Bruce Hansen. "synonyms of Annona squamosa". Atlas of Florida Vascular Plants. Institute for Systematic Botany, University of Florida. http://www.plantatlas.usf.edu/synonyms.asp?plantID=1995. Hinango noong 2008-04-17. ↑ Missouri Botanical Garden (1753). "Annona squamosa L.". Tropicos. http://www.tropicos.org/NameSynonyms.aspx?nameid=1600002. Hinango noong 2008-04-17. ↑ "Current name: Annona squamosa". AgroForestryTree Database. International Center For Research In Agroforestry. http://www.worldagroforestry.org/Sea/Products/AFDbases/AF/asp/SpeciesInfo.asp?SpID=214. Hinango noong 2008-04-17. Huling pagbabago: 16:53, 11 Agosto 2017.